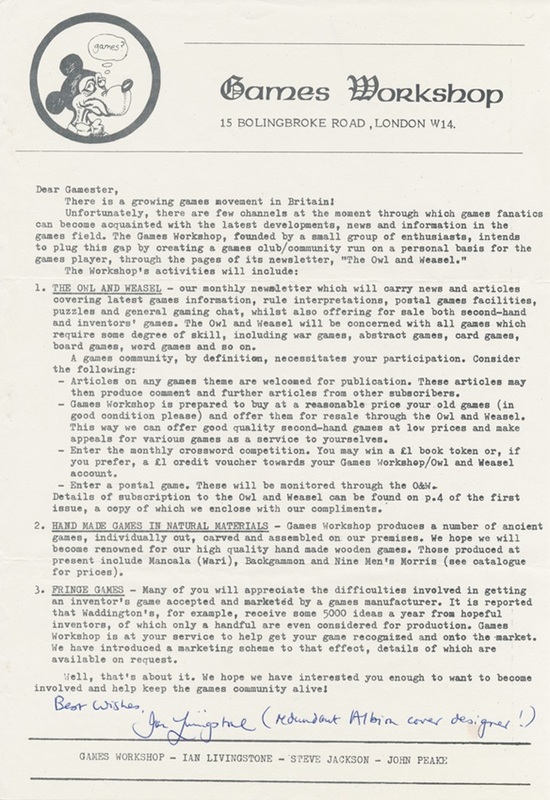 In February 1975, the circular above went out to a few hundred members of the hobby game community. It announced the formation of a new partnership in the United Kingdom called the Games Workshop, founded by Ian Livingstone, Steve Jackson, and John Peake. Their endeavor marked a crucial turning point in gaming as an international hobby: this British start-up operated by eager young fans would provide a launch pad for many games that might otherwise be overlooked by the European audience. Their discovery of one obscure American game in particular would have huge ramifications. In a handwritten postscript to the circular above, Ian Livingstone cryptically identifies himself as a "redundant Albion cover designer." Prior to February 1975, very few British periodicals catered to the hobby gaming community, and those that did focused largely on miniature wargaming. 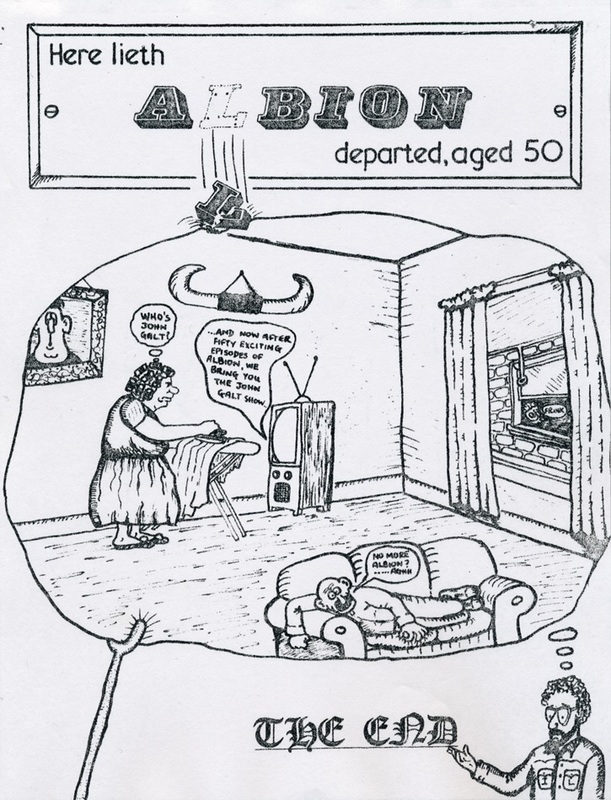 Don Turnbull founded the the zine Albion in February 1969 to cover British Diplomacy games, as well as providing news on the American board wargaming scene surrounding Avalon Hill and SPI. Subscriptions to Albion ramped up slowly: as of December 1970, only fifty names appear on the roster, a tally that included Steve Jackson, a Keele University student in Staffordshire (not to be confused with the Texan Steve Jackson, of GURPS fame). Along with fellow student Peter Roberts, Jackson participated in a postal Diplomacy game published through the zine. As of issue #26 three months later, Ian Livingstone of Cheshire joined as Albion subscriber number 59, and quickly dove into Diplomacy variants himself. But for Livingstone, February 1975 would instead be the beginning. 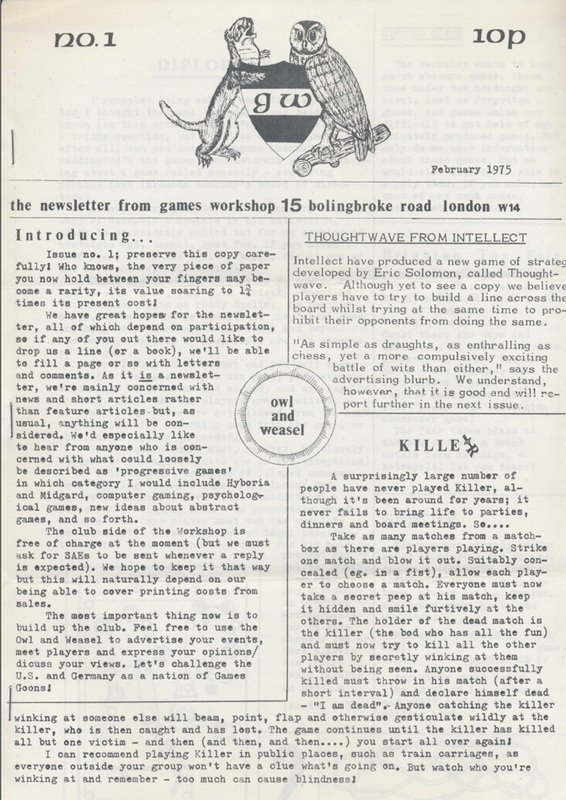 With the Games Workshop circular above came the first oversized issue of a newsletter produced by the company called Owl & Weasel. O&W originally sprawled out in an A4 size format, though an editorial in issue #2 explained that it would be "economically impossible" to continue with that, and thus even reprints of #1 are in a digest size. Issue #1 carried a price of 10 pence, though the introduction began by demanding that readers "preserve this copy carefully! Who knows, the very piece of paper you now hold between your fingers may become a rarity, its value soaring to 1 3/4 times its present cost!" Collectors will report that original O&W's today, especially in that A4 form factor, command a slightly higher premium. Naturally, as they hoped to reach both British and international gamers, the Games Workshop sent out complimentary copies of Owl & Weasel to Albion's subscribers, all of whom were listed in the final issue. That included Brian Blume, one of the three original principals of TSR, who became subscriber 192 as of Albion #47. However, even though the debut O&W expressed an interest in "progressive games" -- including Midgard and Tony Bath's Hyboria. both cousins of Dungeons & Dragons -- they apparently had no idea what was brewing over in Lake Geneva, WI. It wasn't until Owl & Weasel #5 that intelligence reached the Games Workshop of the nature of Dungeons & Dragons. Steve Jackson reported in that issue that he hadn't played a game yet, but he "watched one in progress the other week at City University Games Club, and was fascinated." He promised "more news when I've played it." The following issue, dated July 1975, was suddenly festooned with Dungeons & Dragons. "The Workshop has now had a chance to play the game, and quite honestly, we are obsessed with the thing." Immediately, the Games Workshop pivoted towards the extraordinary new experience in gaming that Dungeons & Dragons offered, and began distributing the game in the UK. They even visited Lake Geneva for Gen Con in 1976. Dungeons & Dragons would dominate the remaining issues of O&W, up to 1977, when Games Workshop retired the zine in favor of their new, professional-grade offering, White Dwarf (which restored the elongated A4 format). We should not be surprised to find Don Turnbull's by-line in the first issue of White Dwarf, nor to find that his regular feature, the "Fiend Factory," would eventually populate the Fiend Folio (1981) published by TSR. Turnbull himself would run TSR's UK division. By the mid-1980s, Games Workshop had put their own stamp on fantasy gaming with their Warhammer miniatures property, and through the many Games Workshop retail stores, they projected a huge international presence in the gaming community ever since. Ian Livingstone and Steve Jackson both made contributions in too many areas to enumerate here. But it is in those early years, as pioneers in the young industry who championed role-playing games in an untested market, that they earned a place in history. The fortieth anniversary of Dungeons & Dragons last year necessarily precedes a spate of related fortieth birthdays, enough to clutter a calendar, but that calendar has plenty of room for the likes of Games Workshop. You know, I really miss the raw energy and outright naivete of those days. Really enjoyed this article, some excellent background information, along with the scans of O&W and The Albion. There are two GW flyers I remember from my youth I'd love to see again: one was a flyer advertising D&D that GW put in their early boardgames (like Warlock, Valley of the Four Winds, Apocalypse, etc.). The other was a flyer for White Dwarf that was in GW's Basic (Holmes) D&D set - I think the cover of WD 13 was prominent (a mighty-thewed barbarian and his lady friend, from a land where clothes were obviously at a premium). Anyway, thanks again for another well-researched article. I remember them from around 1980/81, but having said that, the flyer in the link you posted does look *very* like the one I remember from the GW board games. Excellent!